Cover with foil, bake in oven 30 minutes @ 350 or until cheese is melted. Serve with tortilla chips. Great recipe thanks for sharing... I added a bit more hot sauce and some celery for the texture. Came out perfect! Very tasty!! My family and friends loved it. Will make again soon. This is so easy and excellent! I chopped my chicken instead of shredding it to add more weight to it. This is so good!! I've made it twice now for party's and its a hit! Thanks for sharing. I use the same ingredients for my recipe but make it in the microwave and use canned chicken. In a microwave safe bowl, combine 1 large can of chunk chicken breast, drained, with 1 pkg. of cold cream cheese (cut the cream cheese into smaller pieces before adding to the bowl it melts evenly). Add about 1/3 cup of ranch dressing and whatever amount of Franks hot sauce you can handle. Not sure what other hot sauce brands would taste like in this recipe, but I am addicted to the flavor that Franks gives this dip and will never use another brand. Microwave the mixture on high for 2-3 minutes, stirring halfway through. Take the bowl out of the microwave and stir in 2 cups of shredded cheddar cheese. Microwave on high again for about 1 min or until cheese has melted. Remove from microwave and stir one more time. Serve with tortilla chips. This can also be done in a crockpot (I add the shredded cheese with everything else at one time when I make it in the crockpot). Great. I used blue cheese instead if ranch though. Easy, and a crowd pleaser! This is SO GOOD! Eat it with frito scoops! So yummy! Everyone I have served this to sings its praises and/or begs me for the recipe. I halved this and used 1 large can of chicken and it was soooooo good. Will make again for sure! Sounds Really Good! , i Have to Try it ! Fantastic! If you love wings, you will love this! All the flavor and none of the mess! Made it for Christmas Eve party...it was gone with 15 mins! I add onions with the chicken and tomatoes on top after baking. Everyone LOVES it. I used ranch and franks buffalo hot Sauce. Soooo good!!! Very good and simple...I just dumped all the ingredients into a small slow cooker and let them simmer. Just remember to stir to help the cheese melt. Yum-o! Tried this out a couple nights ago. Used a couple friends as guinea pigs....it was devoured! Fantastic recipe! Will make the list often! 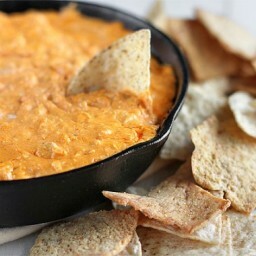 Love, love, LOVE this dip! It has been a favorite in our family for years! I use blue cheese dressing if I have it on hand in place of the ranch sometimes and either way it gets devoured everytime!! Your picture is great... makes you want to just dive right in! I posted this recipe. Yummy.